Peter Lougheed Provincial Park is within the massive Kananaskis Country and is approximately 90 km west of Calgary, along the Kananaskis Trail. 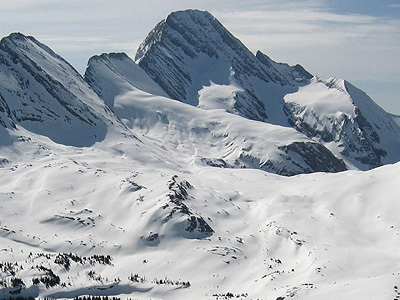 This proximity to Calgary (and Canmore) is a mixed blessing: it’s good news if you live there and want to get out of the city and into the wilderness, it’s bad news if you want to avoid other humans and enjoy a solitary experience in the backcountry. Don’t be too daunted by the cars in the parking lot though—most folks are there to snowshoe or cross country ski. The routes appearing below will get you beyond the masses, and into the wild. It’s where we all want to be, right? 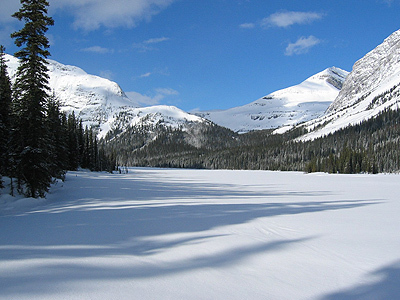 A variety of wildlife can be found in Peter Lougheed Provincial Park, such as grizzly bears, black bears, elk, deer, moose, bighorn sheep, cougars, lynx, wolves and the occasional mountain goat. The routes here go from long to very long so make certain you have adequate supplies and energy. We want to hear about your adventures in the Kananaskis Country so don’t forget to post a trip report in the backcountryskiingcanada.com forums. If you have a new route in the area you want to share, mouse-on over here. N-Joy. All routes listed here provided by An Anonymous Backcountry Powder Junkie. If we have missed anything please let us know? This route is one of the shorter ones featured here and, accordingly, it attracts the most people. It starts at the Burstall Parking lot about 45 km (1 hour) south of Canmore on the Smith-Dorian road in Peter Lougheed Provincial Park. The first 4km of the trip are relatively flat and skins are not required if you pick the right ski wax. You soon gain a prominent logging road west of the lot. After a 10 minute hike from the parking lot you will pass a public BCA Beacon Basin training park and, continuing on, you gradually climb about 75m vertical through the forest until you reach the broad, open valley of the Burstall Lakes. Here you can choose to either stick to the main road winding along through the trees, or detour right onto the more open and exposed Burstall Lakes and alluvial plain. If snow conditions are thin, or it’s windy, the road may offer the better option. After about 2.5km you will reach the obvious start of the Robertson Glacier valley immediately south of you. To carry on to the Burstall Pass area, continue directly west following the marked trail. Once you reach the trees, it’s a good idea to skin up, if you haven’t already done so. From here you will climb about 100m vertical through the forest on moderate switchbacks into the upper valley with the impressive south face of Mount Birdwood above you. Eventually you will come out into an open valley below the Birdwood – Snow Peak Col. Ahead are obvious, large and active avalanche slopes, which are usually threatened by extensive cornices building on the south ridge of Snow Peak. The best (safest) route trends on looker’s left through mostly open sub-alpine forest well away from the runout zones. This is not a good spot to linger or have lunch. Past the avalanche slopes you now begin to get clear views of the North Burstall Pass and some nice yo-yo terrain. The normal route follows the drainage to the left up through a series of small benches. Popping out beyond treeline, follow the obvious route up to the right toward the North Pass (the South Pass is a little over 1km further south). There are lots of options for easy to moderate turns to be had in the terrain you just climbed up through, and a great day can easily be had yo-yo’ing below the North Pass. However, stronger and more advance groups may choose to drop down over the north pass and ski the glades and trees down towards Leman Lake. Bear in mind that you will have to ascend the same route you skied down – which makes for a very long day. Return to your vehicle by the same route you skied-in on. In good snow conditions, there is the option of skiing down a short canyon and avoiding the switchbacks below Mt. Birdwood. One follows the same route to get to the South Pass as for the north. We’ll repeat it here in case you’ve come to this route first. For both routes, start at the Burstall Parking lot about 45 km (1 hour) south of Canmore on the Smith-Dorian road in Peter Lougheed Provincial Park. The first 4km of the trip are relatively flat and skins are not required if you pick the right ski wax. You soon gain a prominent logging road west of the lot. After a 10 minute hike from the parking lot you will pass a public BCA Beacon Basin training park and, continuing on, you gradually climb about 75m vertical through the forest until you reach the broad, open valley of the Burstall Lakes. Ahead are obvious, large and active avalanche slopes, which are usually threatened by extensive cornices building on the south ridge of Snow Peak. The best (safest) route trends on lookers left through mostly open sub-alpine forest well away from the runout zones. This is not a good spot to linger or have lunch. Past the avalanche slopes you now begin to get clear views of the North Burstall Pass and some nice yo-yo terrain. Here are treeline, you can decide if you want to continue on to the South Pass, skier’s left and a little over 1km further south. This will add and hour or so to your route and offers up some nice, moderately steep skiing in the alpine. Return to your vehicle the same route you skied-in on. In good snow conditions, there is the option of skiing down a short canyon and avoiding the switchbacks below Mt. Birdwood. Skiing this entire traverse makes for a super-long day—an early start, decent weather, good snow stability and a high level of fitness are essential. Note that if you aren’t up for the whole traverse, or conditions aren’t right, you can break the tour up and ski it one chunk at a time. On the traverse, you will be travelling through challenging and complex glaciated terrain. Groups should be knowledgeable and equipped to travel in this kind of environment and be able to perform crevasse self rescue. This is an outstanding trip through wild and remote country that is best left for a sunny day in spring. Also, be aware that you can ski the traverse in either direction. Here, we describe the “clockwise” version of the tour (see the map). Departing from the Burstall parking lot, follow the popular Burstall Pass trail until you pass the BCA Beacon park (approx. 10 minute ski). As you climb the road into the trees, you will see a much smaller trail exiting to the left which you should follow. It will take you approximately 1km south into the French Creek valley. Overall, the route to the toe of the French Glacier is pretty straightforward, but, depending on the level of snow coverage, you may be required to do some “creative” route finding. The route follows the drainage all the way up to the terminal moraines of the glacier, but you may be required to detour through forested areas and/or climb steep and rocky creek beds. Don’t be fooled into thinking there is a trail, although there are “trails” that seem to lead in the general direction you want. When it doubt, follow in or as close to the creek as you can. There are also several large avalanche paths that extend down to valley bottom that you will be required to traverse below. The route that seems to offer the lowest avalanche and crevasse exposure onto the glacier involves climbing up a large lateral moraine complex to climber’s left of the glacier. Before reaching the top of the moraine, begin traversing out right towards the glacier, eventually reaching it about ½ to 1/3 of the way to the col. Many groups decide to rope-up here before continuing further. Climb to French-Haig col directly ahead which is further ahead of you than you might think! If you’re at all in doubt about the weather at this point, this is a decision point and may be a good spot to bail. If it’s cloudy down on the moraine it will likely be a total white-out on the glacier. To proceed further to the Robertson Glacier col, turn right once you’re past the huge snow “scoop” bordering the Haig Glacier. Views from here are stunning! 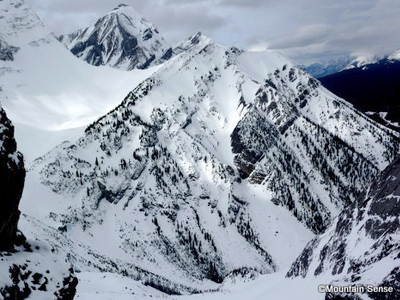 After about 1.5km you will see the Robertson Col about 80-100m above you on the left. The slope that must be climbed is steep, and often has variable wind-loaded conditions. If the snow is firm or icy, having ski crampons and an ice axe can be very handy. 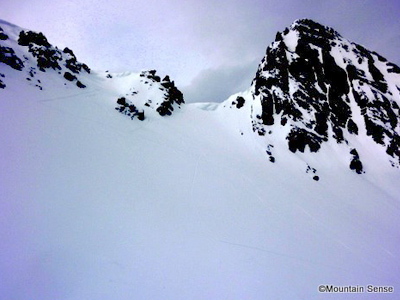 You may need to resort to a bit of boot packing to reach the final col.
Expect to find a cornice in the Robertson Col that can be navigated by doing a short traverse skier’s left. From the col, you may ski down the Robertson Glacier selecting lines that avoid any obvious crevasses and open ice. If visibility is poor, trending slightly off fall line to skiers left offers the most direct route off the ice. Note, over the years global warming has been unkind to the Robertson as more and more holes seem to be opening up, particularly around the base of the glacier. There are also lots of boulders on the moraines below the glacier, which are usually thinly covered by drifted, weak, faceted snow. Exercise caution while skiing out, it can be tricky. To return to your vehicle, exit straight down the 5.75 km long Robertson Valley until you join the Burstall Pass trail and make a right turn. From here it’s a 4km trudge back to the parking lot. And …. Rest. This ski tour is the first one you come to if you turn left beyond the BCA Beacon park, and the trees, onto the much smaller trail. From this trail turning left, continue approximately 1km south into the French Creek Valley. 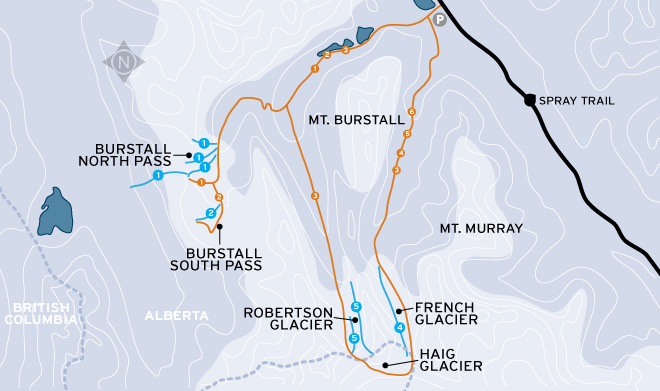 If you choose to follow the French-Haig-Robertson traverse in a “counter clockwise” direction (see the overall map) toward Burstall, you’ll be taking the longer route. Overall, the route to the toe of the French Glacier is pretty straight forward, but depending on the level of snow coverage, you may be required to do some “creative” route finding. The route follows the drainage all the way up to the terminal moraines of the glacier, but you may be required to detour through forested areas and/or climb steep and rocky creek beds. Don’t be fooled into thinking there is a trail, although there are “trails” that seem to lead in the general direction you want. When it doubt, follow in or as close to the creek as you can. The route that seems to offer the lowest avalanche and crevasse exposure onto the glacier involves climbing up a large lateral moraine complex to climber’s left of the glacier. Before reaching the top of the moraine, begin traversing out right towards the glacier, eventually reaching it about ½ to 1/3 of the way to the col. Many groups decide to rope-up here before continuing further. If you choose to, climb to French-Haig col directly ahead which is further ahead of you than you might think! Once on the French Glacier, there are many options for runs down moderate slopes to enjoy. One option is to ski down parallel to your uptrack (see map), which will put you in the direction of your ski-out. To exit, continue north (in the opposite direction of your tracks in) until you join up with the trail heading left toward Burstall, and right, toward the parking lot and your vehicle. The Haig Glacier sits between the French and Robertson Glaciers. In terms of distance and risk exposure, you’ll likely want to access this glacier the same way as you do for the French—in a clockwise direction, after turning left beyond the BCA Beacon park, and the trees, onto the much smaller trail. Your choice will depend on weather/stability, etc..If you want to ski the terrain back down Robertson, you may consider skiing the counter-clockwise direction so you can scope out potential descents as you head in. Look to the big map of the whole area and the options will become clearer. So, for the clockwise route, we follow directions to the French Glacier. After the left turn near the parking lot, continue approximately 1km south into the French Creek valley. 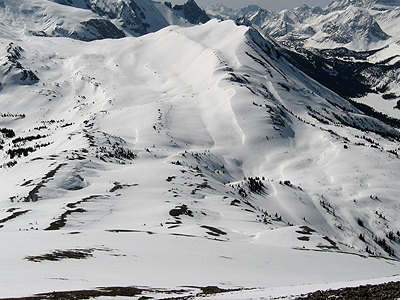 There are several large avalanche paths that extend down to valley bottom that you will be required to traverse below. If you’re at all in doubt about the weather at this point, this is a good spot to bail. If it’s cloudy down on the moraine it will likely be a total white-out on the glacier. The Haig Glacier is adjacent to a huge snow “scoop”--views from here are stunning! 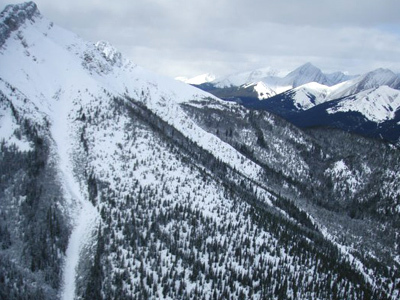 The Haig is a summer training site for the Canadian Cross Country Ski Team and the Beckie Scott Centre for High Altitude Training is located nearby to the south. Sometimes it is possible to see a snow groomer buried in a drift, awaiting the return of elite cross country skiers and biathletes. The Haig Glacier tour is worth checking out if you are curious, or if you have extra energy and want to explore beyond French Glacier (or Robertson if you come from the other direction). Be aware though, that the best descents are from the Robertson and French. As with the French ski-out, there is an excellent descent (see map) parallel to your uptrack, which will put you in the direction of your ski-out. To exit, continue north (in the opposite direction of your tracks in) until you join up with the trail heading left toward Burstall, and right, toward the parking lot and your vehicle. 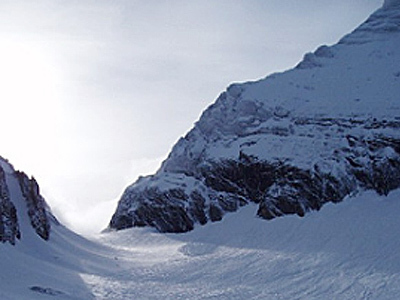 To access the Robertson Glacier as a one-off ski tour rather than doing the whole traverse, it makes sense to follow the traverse route in a counter-clockwise direction. This will enable you to check out potential descents on your ski in, it’ll limit your exposure on the French and Haig Glaciers and the distance is a little shorter. 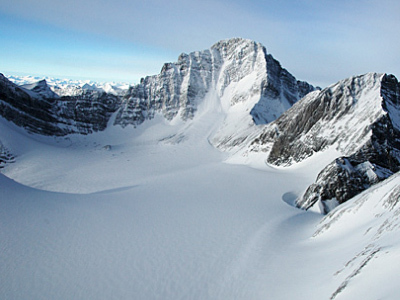 To get to the Robertson Glacier, you follow the first leg of the tour into Burstall Pass (es). In other words, you start off in the same parking lot and DO NOT turn left toward the French Glacier; rather, continue straight along the first 4km of the trip which are relatively flat—skins are not required if you pick the right ski wax. You soon gain a prominent logging road west of the lot. After a 10 minute hike in from the parking lot, you will pass a public BCA Beacon Basin training park and, continuing straight on, you gradually climb about 75m vertical through the forest until you reach the broad, open valley of the Burstall Lakes. After about 2.5km you will reach the obvious start of the Robertson Glacier valley immediately south of you. This is where you turn left, toward the south and the Robertson Glacier. 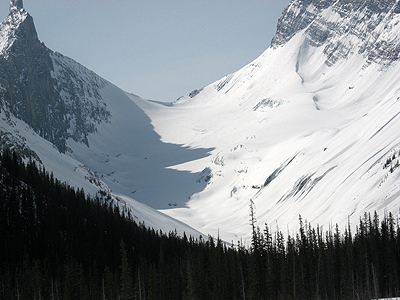 The ski-in is about 5.75km from where the Robertson and Burstall trails meet. Skiing up the final stretch to Robertson Col can be “variable” and full of surprises—be very cautious of crevasses and holes which have opened up all over the glacier (esp. at the bottom). 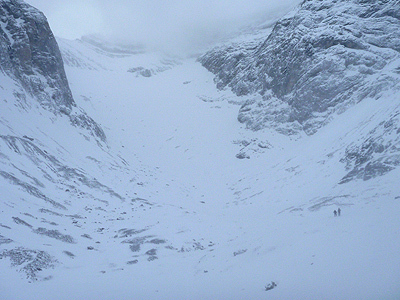 Depending on conditions, the last approximately 100m can be steep—an ice axe and crampons may be handy. From the col, you may ski down the Robertson Glacier selecting lines that avoid any obvious crevasses and open ice. If visibility is poor, trending slightly off fall line to skiers left offers the most direct route off the ice. There are also lots of boulders on the moraines below the glacier that are usually thinly covered by drifted, weak, faceted snow. Exercise caution while skiing out. To return to your vehicle, exit straight down the 5.75 km long Robertson Valley route you came in on until you join the Burstall Pass trail and turn right. From here it’s a 4km trudge back to the parking lot. From the Mount Black Prince parking area, follow the ski tracks or what is normally the summer trail that bleeds off of the parking area due west. After a short distance you will cross Smith Dorrien Creek via a small bridge. Follow a wide trail to the left and as it gets steeper, about .5kms, veer off to the right on to a ski trail. There is a bench here in the summer, but it is normally buried beyond visibility in the winter. You will be on a single track that actually loses several 100 meters elevation and you will want to reapply your skins for this section on the way back. You cross Warspite Creek and work your way up again to the left. Any ski tracks should lead to a narrow and shallow gully (drainage to your right) that ascends at a good movable rate without having to use switchbacks for about .5kms. This gully will eventually take you into the lower section of an easterly ridge that offers top notch glade skiing. (GR 252194) Follow or create switchbacks that lead to the top of this ridge. Stay out of the avalanche slopes leading up to the walled steep cliffs on your left. Towards the top, the ridge narrows and when you hit exposed rock on the ridge, that is the top of this ski ascent. There are bowls to the south and north. I venture to guess that neither is considered safe skiing for the majority if not all of ski season. This is an excellent outing that combines the high passes encountered on the Purple Knob and Hero Knob Loops. Generally done in the spring when stability allows. You can easily bail early after the first col if weather comes in. You’ll have to either leave a second vehicle at the Sawmill Day Use, or hitch hike or ski the 5.5km along the road back to your car at the Black Prince parking when you’re done. From the Black Prince parking, follow the summer trail across the bridge over Warspite Creek and up the gully to the NW that is used to access Black Prince. At the top of the gully continue climbing through forest to the climber’s right of the slide path aiming for the broad bench above 2250m below the east ridge of Purple Knob (GR 240201 NAD 83). The ascent to the (often corniced) col SW of the Knob is serious terrain with no room for bad decision making so if you aren’t sure there are safer turns to be had off of Purple Knob’s east ridge and back the way you came. The col affords good views of the ascent towards Hero Knob and the descent down the NW face is great but starts with a steep & committing slope. At the big bench below the steep pitch, traverse skier’s left to access the flat hanging bench south of Hero Knob at ~2200m. An exposed traverse on a steep side slope is required to get you there. Once on the next bench feature, continue on as for the Hero Knob description or cut the traverse short and continue descending to reach the hwy early if you must. ACCESS: Drive south (from Canmore) or north (from Calgary) on the Smith-Dorrien/Spray Lks. Rd. and park at the Black Prince day use area. This route provided by Shaun King of Mountain Sense. This is an amazing circuit that gets you up high into some neat terrain and then descends the run “Sweet Sixteen” – a 1600 ft. perfect ski line. The loop is described in a clockwise direction which gives the best skiing. From the Sawmill parking, cross over the Smith Dorrien/Spray Trail and ski SE along the shoulder until a clearing in the trees below 2 parallel slide paths allows you to cross over the Smith Dorrien Creek and pick up an old road further south of the slide paths. This road is just visible from the hwy with a keen eye. Follow this road up the drainage SE of Hero Knob (crossing below an impressive avalanche path that gets skied from the summit). When the road ends, the trees thin and you will need to pick your way up steep slopes on the looker’s left (good skiing) to access the hidden open bench above. This access is steep and committing. Once on the bench, either follow it directly up to the Hero SW col, or follow the treed ridge on the climber’s right to gain the summit (more convoluted, but safer). After taking in the summit, assess conditions for the NW facing “Sweet Sixteen” which leads to Murray Creek and out to the car. Good terrain photos for Hero Knob can be found in the photo gallery under “Further Information” at the Government of Alberta Tourism, Parks and Recreation web site on the Kananaskis Country page. ACCESS: Drive south (from Canmore) or north (from Calgary) on the Smith-Dorrien/Spray Lks. Rd. and park at the Sawmill Day use area (between Burstall Pass and Black Prince parking). Purple Knob is an unofficial name given to the peak just under 2500m at GR 240201 (NAD 83). It provides another great circuit in some neat terrain with a fantastic ski descent, but requires good stability. Described clockwise as this is the easier ascent. Cross the Smith-Dorrien Creek at a clearing in the trees and aim for the southern of two drainages that exit east of Hero Knob. Follow this up as it curves around to the SE passing beneath slide paths off of Purple Knob’s NE face (good skiing here under safe conditions). Near the height of land (that passes over towards Warspite Lake), climb WSW through thin trees until the SW col (often corniced) of Purple Knob becomes visible. The ascent to the col is serious terrain with no room for bad decision making so if you aren’t sure there are safer turns to be had off of Purple Knob’s east ridge and back the way you came. The 1500 ft. descent down the NW face from the SW col is amazing but starts with a steep & committing slope. At the big bench below a skier’s left traverse will get you to more uniform slopes for the second pitch. Back in the treed valley bottom, stay skier’s left to pick up an old road that leads easily back towards the highway. ACCESS: Drive south (from Canmore) or north (from Calgary) on the Smith-Dorrien/Spray Lks. Rd. and park at a clearing ~ 1.5km SE of the Sawmill Day use area (between Burstall Pass and Black Prince parking). The glacier is a very safe glacier, with the summer only exposing a bergschrund up high below the headwall on Mt. Rae. The majority of the skiable terrain is exposed to overhead dangers, and the glacier has heavily wind loaded avalanche terrain at the top. Highway 40 in this area is closed from December 1 to June 15. It is best skied mid-summer, early season, and late season after a large spring avalanche cycle to ensure the top of the glacier has slid. Historical debris has been observed right to uphill base of the moraine, and therefore covered all skiable terrain. Rae Charles has very similar conditions. 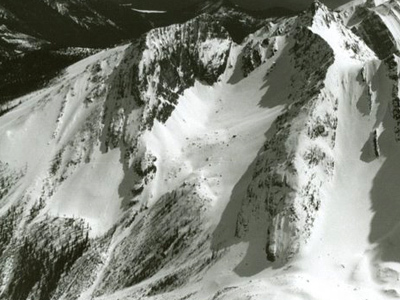 An alternative route would be to summit Mount Rae, as per the scramble described in 'Scrambles in the Canadian Rockies' by Alan Kane, and ski a couloir down to the top of the glacier. Descend as described above. From the parking lot follow the trail to Elbow Lake, turn right at Elbow Lake. The trail winds through the backcountry campsite and back to the lake shore, continue following the trail to the right, uphill, along a drainage. This trail begins to climb steeply after a few minutes, and continues into the alpine. The trail Y's at the base of two Moraines, the right hand trail heads up into Rae Glacier, the left hand trail heads into a glacier commonly referred to as 'Rae Charles'. Continue up the trail on the Moraine onto the Glacier and return the same route. ACCESS: Park at the Elbow Lake parking lot on Highway 40 and follow the trail to Elbow Lake. This route provided by Nicholas Keast.